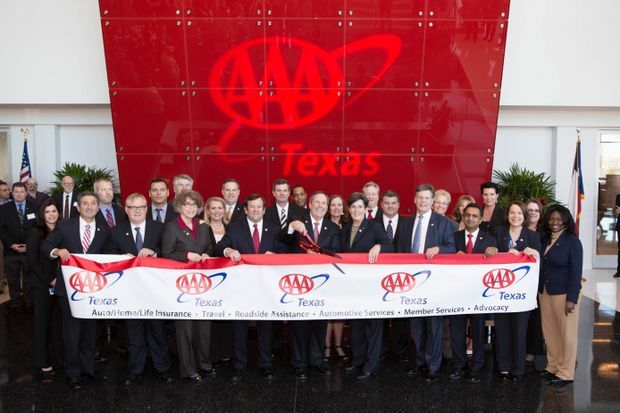 (Coppell, TX) – AAA Texas is growing roots and expanding jobs in the Lone Star State. A Grand Opening and Ribbon-Cutting Ceremony took place at its newly constructed corporate headquarters at 1225 Freeport Parkway, Coppell, TX 75019 on Friday, March 6, 2015. AAA Texas will hire 100 people in the near future to add to its current workforce of approximately 1,100 at the new building. The new positions will include customer service representatives, insurance agents, travel agents and branch administrative positions. Coppell Mayor Karen Hunt and Coppell Chamber of Commerce President Kristi Valentine joined Auto Club Enterprises President & CEO Robert Bouttier along with other company executives to offer remarks and cut a red ribbon during Friday’s ceremony. With 250,000 square feet of space under one roof, the AAA Texas Regional Administrative Office is the largest, single-tenant office building in Coppell. Auto Club Enterprises purchased the property in March 2013 and the design, construction and move into the new building was accomplished in two years. AAA Texas evolved from a group of 30 local motor clubs that date back to the early 1900’s. Today, AAA Texas is a diversified membership organization that offers roadside assistance, travel services, auto, home and life insurance, automotive buying services, auto repair programs, as well as transportation and traffic safety advocacy. AAA Texas is part of Auto Club Enterprises, which is the largest group of AAA-affiliated motor clubs in the country. An Employment Open House will take place at the new Regional Administrative Office on Wednesday, March 11 from 3:00 p.m. until 7:00 p.m. Learn more about AAA and opportunities available, or apply online by visiting www.aaa.com/txjobs.